This publication is available as a printable PDF – here. Willow is planted in spring of the second year after the site has been thoroughly prepared. Refer to the Site Preparation and Willow Calendar fact sheets for the tasks required before planting to ensure a proper planting bed and control of competing vegetation. The numerical headings below (2.1 and so forth) refer to the year and task number, and correspond to other fact sheets in this series. Follow standard safety protocols for all tasks and refer to the Penn State University Safety and Health Management Planning for Biomass Producers guidebook for more information. These and other resources are available at www.esf.edu/willow. Prior to planting willow, terminate any cover crops using a roller-crimper (Figure 1), mower, or contact herbicide. This creates a mat of dead vegetation that acts as a mulch layer to minimize erosion potential and control competing vegetation during the first growing season. 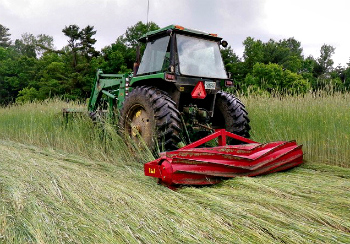 A roller-crimper can be mounted on the front of a tractor, with the willow planter on back, to roll the cover crop and plant willow in one pass. Cover crops should be terminated early enough to avoid excessive vegetation which can clump up on willow planters and reduce their effectiveness. The recommended planting window for New York State and most of the Northeastern U.S. is late April to early June. Timing will vary with weather and location. Starting too early increases the chance of cold air and soil temperatures that will slow the onset of bud-break, or a hard frost which could damage recently sprouted plants. Fields may also be too wet to operate machinery in early spring. Starting too late in the season runs the risk of soil and plants drying out if weather becomes too hot and dry before a sufficient root system is established by the willow. Waiting longer also gives competing vegetation a head start on the willow and leaves a shorter growing season. Planting stock must be ordered several months in advance to allow sufficient time to process and ship the order from the nursery. High-yielding willow cultivars developed for bioenergy plantings by SUNY-ESF and Cornell University are available from Double A Willow (www.doubleawillow.com). Breeding has produced shrub willow cultivars in six diversity groups that represent a range of species and crosses within the Salix genus. Plant at least three groups in each field for genetic diversity. 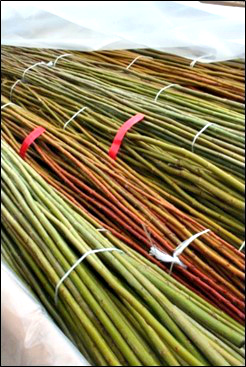 Willow planting stock, known as “whips” (about six-feet-long stems), are dormant, one-year-old hardwood cuttings harvested over winter that must be kept cool and moist until the time of planting to maintain viability. A refrigerated truck at 28-30 degrees Fahrenheit is recommended to store whips if planting will take more than five days. If planting smaller acreages that can be completed in a few days’ time, whips can be stored without refrigeration in a cool, shaded area. Once whips are thawed, they should not be refrozen, if possible. Once thawed, whips can remain dormant up to one week, including transport time, under cool and moist conditions and with proper handling. Cuttings that have sprouted should not be planted because the probability of survival is lower. If whips are exposed to high temperatures and/or allowed to dry out they will lose viability. Never leave boxes of whips out in the open sun, especially with plastic liners sealed, because they will heat up rapidly causing a drop in viability. Whips are planted through the terminated cover crop or into bare ground using a mechanized tractor-mounted planter. 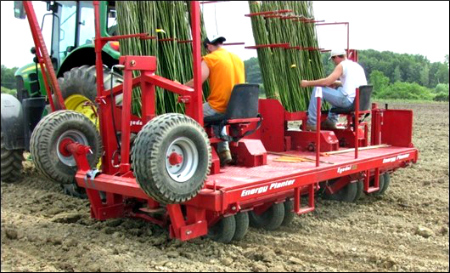 A minimum 140-horsepower tractor is required to operate a willow planter. Whips are loaded onto the planter in bundles and fed individually into guide belts. The planter cuts each long stem into smaller sections (cuttings) and inserts them into the ground. Studies of commercial willow planting operations have shown this system to be capable of planting about two to three acres per hour. Two to four people — depending on their experience level, planter model, and planting pattern — ride on the planter to load whips. The length of the cutting is generally set at eight inches, but can be varied if necessary for different soil types. Two planter models are available in the Northeast for machinery rental or custom rates from Celtic Energy Farm (http://celticenergyfarm.com/) and Double A Willow (www.doubleawillow.com). The most common willow planting pattern is an offset double row. This pattern leaves two feet between plants within the row, two-and-a-half feet between rows, and a six-foot alley between double rows (Figure 4). An alternate planting pattern is a single row with one foot between plants and an eight-and-a-half-foot alley between rows. Both of these planting patterns can result in one plant per linear foot down the single or double row. This equates to a density of about 5,500 plants per acre under cultivation (not including headlands). Maintaining at least six-foot alley spacing between rows is important so harvesting equipment can drive down the rows without running over willow stools (stumps) left in the field after harvest. Stool size will expand with repeated harvests and coppice regrowth and the cut stems/stool can puncture tires. The wide alleys ensure that machinery can proceed down the row without running over sharp stools/stems. The planting design for each field should be thought out carefully, because the long life expectancy of willow adds importance to this initial decision. Rows should be as long as possible while maintaining at least thirty-foot headlands. See the research summary on Maximizing Planted Area for more information (http://articles.extension.org/pages/73581). GPS guiding planting and automatic steering equipment are recommended. Immediately after planting, apply pre-emergent herbicide to control competing vegetation. Choose an herbicide or herbicide mix based on the soil type, the species on the site prior to planting, and species in surrounding fields. Consult an expert and follow the manufacturer’s instructions on the label. It is important to achieve sufficient plant density and distribution for willow to become the dominant vegetation across the entire planted area. One to two weeks after planting, new stems and leaves will begin to emerge from the planted willow cuttings. Fields should be evaluated about two weeks after planting to ensure that no large sections have been left unplanted due to mechanical or human error, and to verify that all cuttings were viable and have become established. Typically, ninety percent of the cuttings will survive. Areas that have less than seventy-five percent plant density should be replanted, either mechanically for large continuous sections, or with six- to eight-inch cuttings by hand for smaller areas. A common method is to survey the field in a utility vehicle and replant six-inch cuttings in areas of low density. Inter-planting after the first growing season is generally not effective, because both weeds and other willow have already begun to occupy the site and will outcompete new willow started from cuttings. Crops should be monitored periodically throughout the growing season on foot, in a utility vehicle, or with the authorized use of an unmanned aerial vehicle (UAV). Key factors to note while scouting include willow growth and vigor, competing vegetation, pests and diseases. Growth will vary during the first season by cultivar, precipitation, temperature, and soil conditions. Generally, plants should be four to six feet tall by the end of the first growing season, with two to four stems per plant. If weed control is adequate and growth rates are normal, no further action is required until after leaf-fall. If inadequate weed control is hindering willow growth, take additional measures to control competing vegetation. Cultivators and rototillers can be used for mechanical vegetation control in the alleys. Annual species can often be controlled with one round of mechanical cultivation, whereas perennials may require several rounds. Mowing is another option for mechanical control using a utility vehicle and pull-behind mower. Willows are highly sensitive to most broad-spectrum post-emergent herbicides, so their use is not recommended, even with shielding. Some options exist for treating specific broadleaf weed species with products that do not affect willow. Grasses can be controlled with grass-specific herbicides without effecting the willow. Consult an expert for guidance and follow the manufacturer’s instructions on the label. Shrub willow cultivars developed by SUNY-ESF and Cornell University are bred and selected for disease and pest resistance, but willow plants are biological systems in nature and the possibility of disturbances to any crop is unavoidable. A variety of insects, rusts, cankers and other pests and diseases can affect willow, so plants should be checked for infestation during crop monitoring and problems addressed using integrated pest management. For more information on common willow pests and diseases, and how to treat them, refer to Cornell Willowpedia (http://willow.cals.cornell.edu). Headlands (Figure 5) are maintained by mowing once or twice per year for access and to suppress woody vegetation. This maintenance it is important to ensure that equipment can easily access the field during crop scouting and harvests. After the first growing season, coppice (cut back) willow plants using a sickle-bar mower. It is important that the mower has sharp blades, and is driven at the appropriate speed to ensure that the cut is clean and the willow is not pulled out of the ground. Cut the willow stems about two to three inches above ground level. Coppicing promotes more stems per plant and quicker canopy closure in subsequent growing seasons. There is little economic value in biomass cut after one growing season, so stems are left in place on the ground to decompose. If fertilizer is being applied, it is generally done so in early spring of the second growing season, and after each harvest when the full site can be accessed. See Nutrient Management fact sheet for more info. Harvesting is conducted once every three to four years. Crop monitoring and appropriate follow-up activities for weed and pest control are most important in the two years after coppice, and after harvest. Once the crop has formed a closed canopy, weed control within the planting is generally not needed. At the end of the planting’s life cycle, willow can be harvested and the stools removed with herbicide and a forestry mulcher, and soils can be replanted with willow or other crops the following season. See Stock Removal fact sheet for more information. NEWBio Project Resources – information on the research, opportunities and challenges in developing a sustainable system for the thermochemical production of biofuels from perennial grasses grown on land marginal for row crop production. Justin P. Heavey and Timothy A. Volk. © 2016 The Research Foundation for the State University of New York College of Environmental Science and Forestry.